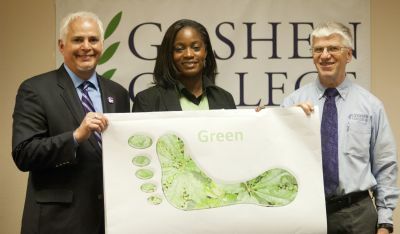 We have been and continue to be on a journey at Goshen College to go green. The roots of our ecological stewardship journey are Christian faith and the belief that God calls us to care for all of creation. Read on to learn how we are encouraging sustainable practices and reducing use of fossil fuels on campus. In 2013, President Jim Brenneman announced that Goshen College would begin voluntarily purchasing 100% of electricity from renewable energy sources, such as wind and solar power. This single action reduces the college’s carbon footprint by about 45 percent. Read more about Goshen College’s commitment to renewable energy. 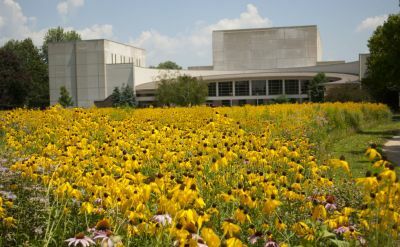 In recent years Goshen College has converted 12 acres of its approximate 55 acres of lawn to native landscaping, establishing several areas of low-profile native grasses and perennial wildflowers. In addition to creating a more diverse landscape, this project has led to an improved habitat for birds, small mammals and insects; a reduction in mowing and chemical herbicides; less irrigation; and improved air quality. 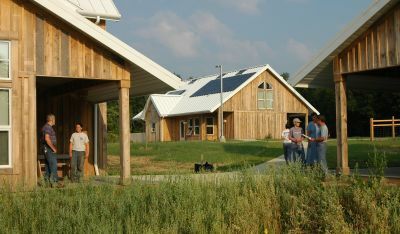 Rieth Village is an ecological field station for undergraduate programs at Merry Lea Environmental Learning Center. Two cottages provide housing for up to 32 students, and a third cottage serves as the initial classroom and office building. In 2007, Rieth Village was awarded the platinum LEED certification (55 points) from the U.S. Green Building Council, the highest level possible. A 924 solar panel array on top of the Rec-Fitness Center roof completely meets the energy needs of the campus’ Church-Chapel building. As well, the SunShower Collector System is a student-driven and faculty-supported project that uses solar energy to heat the shower water in the Rec-Fitness Center. Goshen College uses LEDs in many locations around campus, including the elevator lights and major parking lot areas. The college also has motion light sensors in many of its buildings and in outdoor lighting facilities to cut down on amount of energy used for lighting when not needed. The college uses geothermal heat pumps for the Student Apartments, Recreation-Fitness Center, Good Library, Umble Center and a portion of the Union Building. Geothermal heat pumps use moderate temperatures in the ground to boost efficiency and reduce the operational costs of heating and cooling systems. In 2007, President Brenneman signed the President’s Climate Initiative, making Goshen College the second higher education institution in Indiana and the first Mennonite college to sign the landmark commitment to climate neutrality. Goshen College has been honored for the third consecutive year with 2017 Tree Campus USA® recognition by the Arbor Day Foundation for its commitment to effective urban forest management. Goshen College is on its way to becoming an officially certified Bike Friendly Campus. 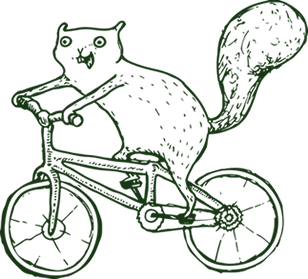 In 2016, the League of American Bicyclists gave out the Bike Friendly University (BFU) awards, including honorable mention to GC. Goshen College has been named Indiana’s first Bee Campus USA and is just the second college in the Midwest and 27th nationally to be recognized for its work in supporting pollinators such as bees. Read up on more of the latest sustainability news at GC! Goshen College’s Ecological Stewardship Committee is comprised of students, faculty and administrators who lead the campus in collaborative efforts to encourage sustainable practices and reduce use of fossil fuels. – Advancement: Forms and updates a sustainability strategic plan, establishes benchmarks and locates resources. – Audit: Gathers data to establish carbon footprint and fulfill other evaluation criteria in the sustainability strategic plan. – Analysis: Reviews proposals for projects, helps to fine-tune plans, brings recommendations to ESC for action. – Awareness: Promotes ecological stewardship awareness on campus and broader awareness of Goshen College sustainability efforts through special events, sustainability website and print media. Goshen College is a member of the Association for the Advancement of Sustainability in Higher Education.